As Co-Director of photography on the highly acclaimed 70mm IMAX production “Antarctica”, I wanted to show not only the frozen continent in all it’s magnificence but also wanted to put the audience in places they would never be likely to go, such as under the frozen sea ice. While filming sequences of Weddell seals and their pups, my team knew it was important to follow them into the water where they would be totally at ease. These beautiful mammals move and look quite uncomfortable on the ice, but swim like ballet dancers under water, living quite happily in the sub zero conditions. Seals tend to gather around tide cracks and pressure ridges in the ice, where gaps in the frozen sea, created by the constantly moving ocean, give them an ideal entry point for diving. Here, the two-metre thick under ice surface, changes from an endless flat sheet, into a mass of huge jumbled blocks. The constant ocean movement, forces ice into miniature upside down mountain ranges and creates a perfect environment for the Weddell seals. When ice diving in Antarctica, the logistics involved can be enormous and to be safe everything has to run like clockwork. A shelter has to be erected to offer some form of protection from the icy wind, diving gear needs to be assembled and double checked and for filming our job, the large IMAX camera had to be loaded and prepared in its underwater housing. To work safely underwater and below ice requires special skills and gear with back up systems for almost every piece of equipment used. If a diver was a hundred metres away from an entry point and something went wrong, it could be impossible to just come directly to the surface, as it would be frozen solid. 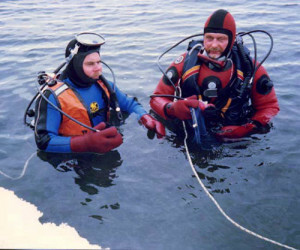 We used twin air cylinders, freeze resistant independent regulators, dry suits, safety lines and specialized accessories to combat the sub zero conditions for the forty minutes or so each filming dive required. After getting in the icy water with the camera, we searched out and very carefully approach the seals to avoid disturbing them. Malcolm knew from experience, that film stock becomes very brittle at low temperatures and as they were working in air temperatures around minus 20° C and seawater at minus 1.8°C, the crew had to be extra careful. Even so, on several occasions while filming under the ice, the film broke and the camera ground to a halt. It was disheartening to hear because despite being chilled, it meant aborting the dive and getting everything out of the water. Having no camera assistant meant Mal stripping halfway out of his dry suit (so as not to drip salt water into the cameras mechanism) and having to clean and reload the camera, reassemble the underwater housing and get back into the icy water. Not much fun when you are already chilled. Capturing the footage of the Weddell seals under the Antarctic ice was a difficult task but well worth the effort. When the audience watches the footage on the huge IMAX screen, they see the opaque ceiling of ice above, super clear water, the jet-black of the deep ocean below and the graceful movement of the Weddell seals. watching this film in IMAX really does give the viewer the experience of diving below the ice. The Emperor Penguin, one of the most impressive birds in Antarctica was one of many subjects cinematographer Malcolm Ludgate ACS filmed during the production of the 70mm IMAX film Antarctica. As well as filming these colorful, one metre high birds on the sea ice, he also wanted to give the audience a true appreciation of their stateliness, by taking the bulky IMAX camera and its underwater housing into their spectacular under ice world. 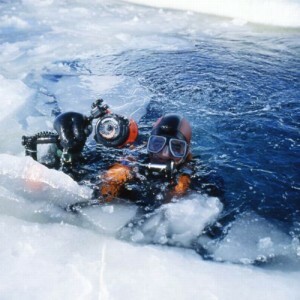 Diving under ice is enormously problematic, challenging and extremely demanding. Seawater temperature is often as low as minus 1.8° Celsius which necessitates the wearing of dry suits to help keep out the cold. Any exposed skin on your face quickly becomes painfully numb in icy water and even after it's acclimatized to the cold, your face feels like you’ve just come from the dentist. After ice diving, you can’t just quickly climb out of the water expecting to dry off and warm up when air temperatures are often below minus 20° Celcius. Before each dive the team erected a special dome shelter for protection from the wind and elements to prevent themselves from becoming dangerously cold. The IMAX Mk II underwater camera kit is as large as a car engine and weighs a hefty 90kg (about 198 lbs). 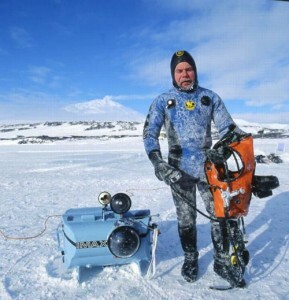 It’s a big piece of camera kit and it's use was made even more difficult under the conditions encountered in Antarctica. For example, when filming under the ice, even the simple task of holding the camera causes the warming blood to be squeezed out of fingers making it necessary to wear extra thick mittens underwater. Mittens help to stop your hands becoming bitterly cold, but they also restrict the operation of both the camera and diving gear alike. Filming Penguins underwater in this dangerous and hostile environment often required Malcolm Ludgate ACS and his team to cut an opening in the sea ice and lower a specially developed safety cage into the hole. This safeguard removed the possibility of attack by marauding Leopard seals at some locations. The cage, large enough to fit two people, also stopped divers from being dragged away by the unpredictable currents under the sea ice and provided a perfect vantage point from which to film. For one Emperor penguin sequence, Malcolm crammed himself into the bottom of the safety cage to film scientist Dr. Gerry Kooyman entering the water. To get the shot, he had to be upside down and hold his breath to keep bubbles out of frame and use his feet for stability while trying to ignore a stream of icy water which started slowly leaking into his dry suit past a neck seal. Ice water sneaking in feels like battery acid leaking into your suit and quickly chills divers to a point where they can become hypothermic. Malcolm says all the discomfort of working in the sub zero water is well worth because we captured the wonderful underwater ballet performed by the Emperor penguins as they rocket towards the surface and onto the frozen sea ice. 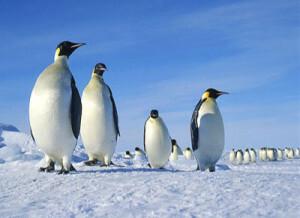 The emperor penguins sequence in the IMAX film “Antarctica” is one of the audience favourites.